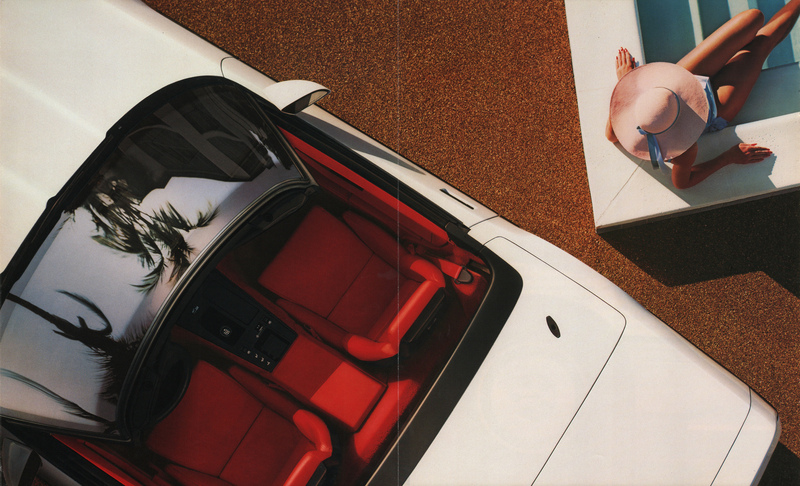 For 1986, the big news for Corvette was the return of the convertible, gone since 1975. Other improvements included Bosch ABS II anti-lock brakes, a Vehicle Anti-Theft System (VATS), and the mid-year introduction of aluminum cylinder heads. The standard powertrain was the L98 235 bhp 5.7 liter/350 ci V8 with fuel injection paired with a Turbo-Hydramatic four-speed automatic transmission. Car and Driver recorded 0-60 time of 6.0 seconds and a top speed of 144 mph. Estimated fuel economy was 17 city/24 highway by the standards of the day (15/22 by today’s standards). With a 20-gallon fuel tank, a Corvette convertible’s proud new owner could expect a range of between 335 and 370 miles with a 10% fuel reserve. Built in collaboration with ASC, the convertible included a manual top, a rear-hinged deck panel to cover the top, and an X-brace underneath the floor. The newly-required high-mounted rear brake light was integrated into the rear fascia. Even the gas filler cover was different from the coupe—square because there was no rounded rear hatchback glass for it to wrap around. Standard exterior and mechanical equipment for the $32,032 Corvette convertible (about $76,700 in today’s dollars or about what a well-equipped 2019 Corvette Stingray convertible goes for) included a Delco Freedom Plus II battery, power operated quartz-halogen retractable headlamps, power rack-and-pinion steering, power brakes, and P255/50VR-16 tires on 16 x 9.5 inch cast alloy aluminum wheels. Inside, air conditioning, power windows, Tilt-Telescopic steering wheel, driver information system, cloth seats, and an AM/FM stereo radio with power antenna were all included. Optional exterior and mechanical equipment included performance axle ratio ($22) and Delco-Bilstein shock absorbers ($189)—the Doug Nash 4+3 manual transmission was a no-cost option. Optional interior equipment included cruise control ($185), power door lock system ($175), electronic control air conditioning ($150), a six-way power driver’s seat ($225), and the Delco-GM/Bose Music System ($895). The Z51 Performance Handling Package was not available with the convertible. Pages from the 1986 Corvette convertible, linked from the always useful PaintRef.com. There is strong club support for the 1986 Corvette, as there is for all Corvettes. According to Hagerty’s valuation tools, all the money for a 1986 Corvette convertible in #1/Concours condition is $20,200, with a more normal number #3/Good condition car going for $7,700. 1986 Corvette convertibles are regularly featured in the Hemming’s Motor News classifieds and on eBay Motors—as I write this in December 2018, there’s a Yellow car with black leather seats and 29,000 miles available on Hemmings for $17,900. Make mine White, with red leather seats—the “heritage colors” that match the first Corvette back in 1953. 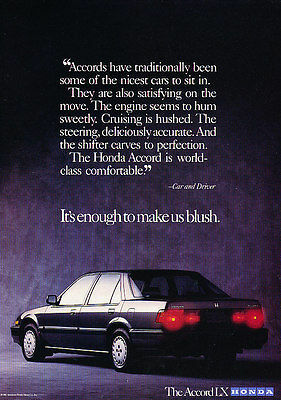 The Honda Accord was all new for 1986, with a brand new body and upgraded engines—the standard powertrain was the A20A 98 bhp 2.0 liter/120 ci inline four with two-barrel carburetor paired to a five-speed manual transmission (a four-speed automatic was optional). Acceleration was acceptable: 0-60 came in a little under 11 seconds in the approximately 2,400-pound car. Mileage was good: 27 city/33 highway by the standards of the day (about 23 city/30 highway by 2018 standards). With a 15.9-gallon fuel tank, Accord drivers could expect a range of from 380 to 430 miles with a 10% fuel reserve. By modern standards, the 1986 Accord was not a large car: with a 102.4-inch wheelbase and a 178.5-inch length, it was four inches shorter in both wheelbase and length than a 2018 Honda Civic and was classified by the EPA as a subcompact car (the modern Accord is classified as a large car). What’s even more striking is the height or lack thereof: at 53.3 inches, the Accord was only three inches taller than the same year’s Camaro. The 1986 Accord had a six-inch longer wheelbase, three inches more of length, and was almost an inch shorter than the 1985 version. Standard equipment on the base Accord DX sedan included front wheel drive, double wishbone front and rear suspension, power brakes, variable-assist power steering, pop-up halogen headlights, hidden wipers, and P185/70R13 tires (a size still available) on 13-inch wheels with full wheel covers. Inside reclining front bucket seats, an adjustable steering column, and cruise control were included. The DX went for $9,299—about $21,600 in 2018 dollars. Moving up to the LX added air conditioning, power door locks, power windows, and an AM/FM stereo with cassette player and power antenna. The top of the line LXi went for $12,675 (about $29,400 in today’s dollars or about what a 2018 Accord EX-L sedan goes for) and added the 110 bhp fuel injected engine, cast aluminum alloy wheels, and a power moonroof. The 1986 Honda Accord was well received. It was present on Car and Driver‘s 10 Best list and got good reviews. Honda sold 325,000 in the United States, making it the fifth best selling car model that year. Third-generation Accords were once prevalent on American roads, but have virtually disappeared by now. You do occasionally see these Accords for sale in the Hemming’s Motor News classifieds and on eBay Motors, but there were no sedans out there as I write this in July 2018. 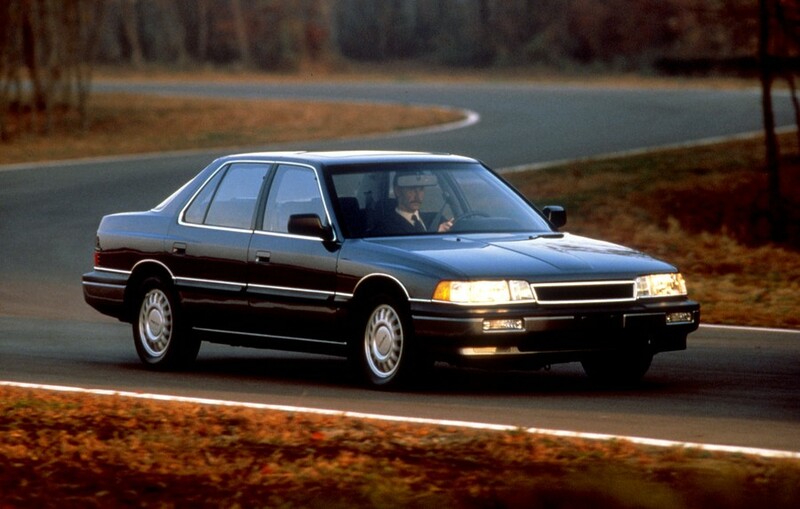 The 1986 Acura Legend Touring Sedan was the top of the line vehicle available from the then brand new Acura brand and the first Honda product made with a six-cylinder engine. I have always said that Honda is an engine company and the Legend’s C25A 151 bhp 2.5 liter/152 ci fuel-injected 24-valve SOHC V6 was an interesting one, with a 90 degree V-angle to the crankshaft. Mileage with the five-speed manual transmission was decent—20 city/25 highway by the standards of the day (18/23 by 2018 standards), giving the Legend a 330 to 365 mile range with a 10% fuel reserve. With that same five-speed manual, 0-60 mph came in a little under nine seconds in the 3,078-pound car. Standard exterior and mechanical equipment in the $19,898 sedan (about $46,100 in 2018 dollars—just a little over what a loaded 2019 Acura TLX costs) included four-wheel disc brakes, a power tilt/slide sunroof, power folding mirrors, remote locking/keyless entry, and P205/60R15 tires (a size still readily available) on 15-inch wheels. Inside, an information system that could monitor maintenance intervals, fluid levels, and fuel economy, a driver’s side air bag, a power driver’s seat, and adjustable rear seats were also included. The only option available was a four-speed automatic transmission. I don’t see a lot of Legends come up for sale in either the Hemmings Motor News classifieds or on eBay Motors. First generation Legends have a small but avid following (with decent online support), and I find that they stand out when I see them. Make mine Blade Silver Metallic, please. Chevrolet’s Cavalier Z24 was announced for the 1985 model year but didn’t actually become available until the 1986 model year. The most important feature of the Z24 was definitely the engine—GM’s corporate LB6 120 bhp 2.8 liter/171 ci V6 with multi-port fuel injection. Paired with the standard four-speed manual transmission, 0-60 came in about 8.5 seconds in the 2,450-pound car—decent for a sporty compact car in 1986 (the 102 bhp Volkswagen GTI hatchback of the same year was about as fast). Mileage was 19 city/26 highway by the standards of the day (19/24 by today’s standards). 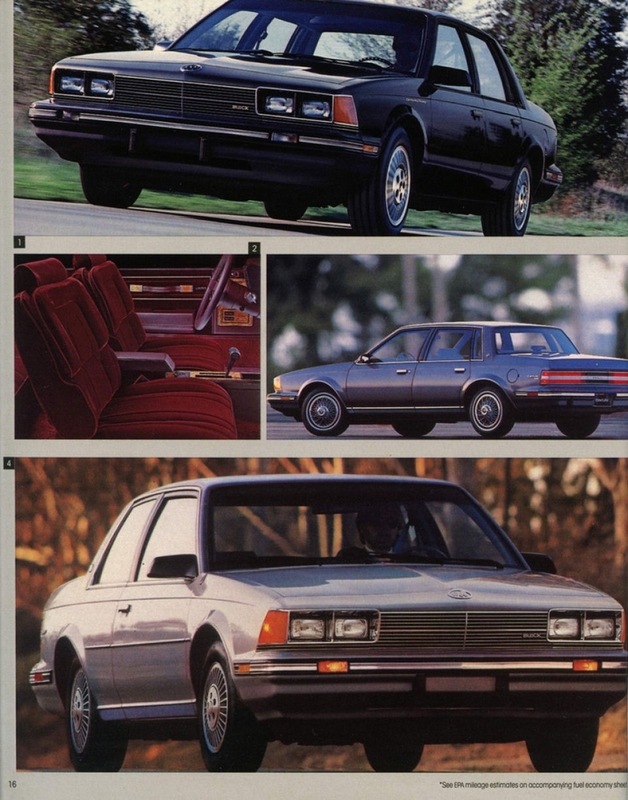 The Z24‘s range was 265 to 275 miles with a 10% fuel reserve—like all Cavaliers, the fuel tank was 13.6 gallons. Standard equipment on the $8,878 Z24 (about $20,600 in today’s dollars) included the aforementioned engine and transmission, a ground effects package, black grille, dual black sport mirrors, the F41 sports suspension, and P215/60R-14 Goodyear Eagle GT radial tires (a size still available thanks to Riken and BFGoodrich) mounted on 14 x 6 inch Rally wheels. Inside, all Z24 buyers received digital instrumentation fed from “a 16K computer,” including a tachometer and trip odometer, along with a rear window defroster, and an AM pushbutton radio with dual front speakers. All Cavaliers included front wheel drive, a MacPherson strut front suspension, rack and pinion steering, and front disc/rear drum brakes. Inside, reclining front bucket seats, a full floor console, side window defoggers, and a day/night rearview mirror were standard. Available options included 14-inch aluminum wheels ($173), tinted glass ($99), air conditioning ($645), cruise control with resume ($175), power door locks ($130), power windows ($195), Comfortilt steering wheel ($115), and an electronic-tuning AM stereo/FM stereo seek/scan radio with cassette player, graphic equalizer, and clock ($494). A comfortably optioned Z24 could easily reach almost $11,000 (about $25,500 in 2018 dollars or about what you’ll pay nowadays for a loaded Chevrolet Cruze Premier sedan). Cavalier Z24 pages from the 1986 Chevrolet Cavalier brochure, linked from Hans Tore Tangerud’s amazing lov2xlr8 website. Handsome in a broad-shouldered sort of way, the Z24 coupe sold pretty well for 1986—about 36,000 units. The slightly more expensive hatchback added another 10,000 units: the two models accounted for about 11% of total Cavalier production. Power would increase to 130 bhp in 1987, and a convertible version of the Z24 would come along in 1988. Chevrolet would build the Cavalier Z24 until the end of the 2002 model year. A few folks are collecting these cars, but they certainly aren’t common at shows. 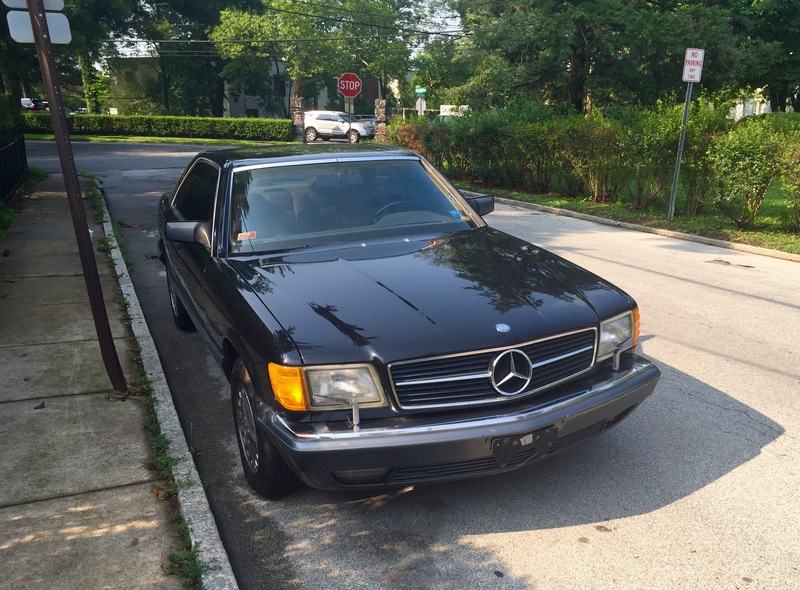 You do occasionally see Z24s for sale in the Hemming’s Motor News classifieds and on eBay Motors: as I update this blog entry in February 2019, there’s a Dark Red 1989 Z24 convertible with black cloth seats and 29,000 miles listed on Hemmings for $14,900. Other J cars in this blog include the 1982 Cadillac Cimarron sedan and the 1988 Cadillac Cimarron sedan. I will not ignore Buick, Oldsmobile, and Pontiac forever.